During college I was in love with a salad from a local restaurant. It was always refreshing, consistent, and filling! My best girlfriends and I ate it at least once a week — it was our favorite! I swear the waiters began to know us by name, but that MIGHT have been because we always took at least 10 of the free lollipops they set out in a large bucket. I don’t know why we thought free meant endless supply? Anyway ordering dirty martinis and a chopped salad with no bacon and dressing on the side was our tradition. I do have a little advice for you: always eat food before martinis. Seriously remember that. So, what’s a chopped salad anyway? 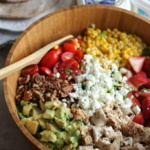 It’s simply a salad that includes fresh produce and ingredients that have been ‘chopped’ (or just cut up to fairly equal size), then the salad is typically tossed together. Flavors can be adjusted and dressing may be used. 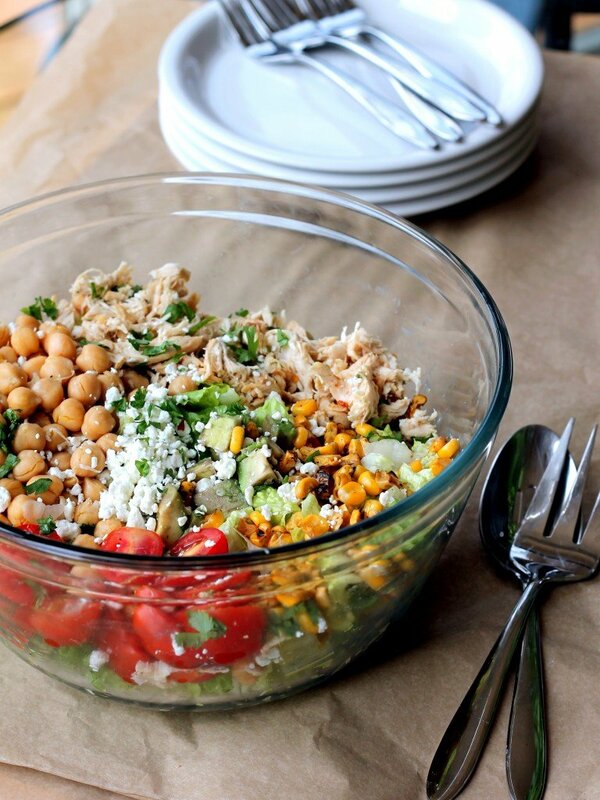 Chopped salads are very popular in restaurants as they make the perfect lighter meal. I know the question you want to ask me. And the answer is YES, you will look like Heidi Klum if you eat salads like this for dinner… every night… for the rest of your life. 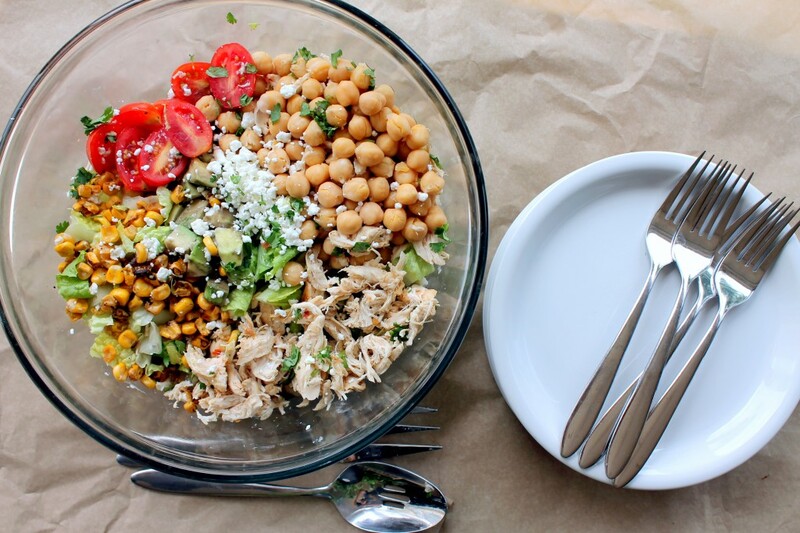 To make the salad I started with fresh romaine hearts then I added protein: pulled chicken breast and chickpeas. The rest? Grilled sweet corn (or whatever you have on hand), fresh grape tomatoes, avocado, crumbled goat cheese, and fresh chopped cilantro. Then tossed (or drizzled) with any dressing you desire. I drizzled mine with my favorite BBQ sauce; it was heavenly. Seriously this salad is just GOOD. It makes you feel good. In fact I’m starting to think it even makes good things happen. Just the other day I found $20 I never knew I had. Yesterday I made the best banana bread I have EVER made in my life. Today I had an amazing meeting! Oh, and I’ll be traveling again soon! In any case, I need to eat more chopped salads. That way I can eat more cake. You see how my brain thinks? It a vicious cycle. 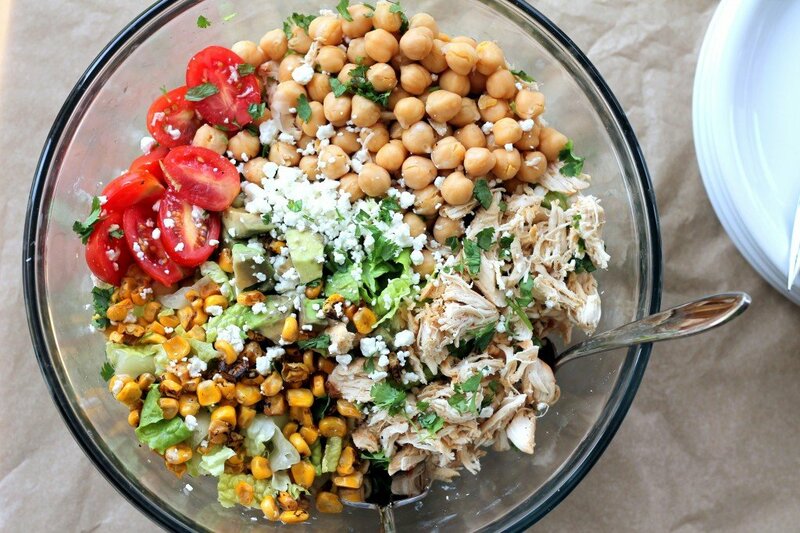 A healthy, delicious salad that's super easy to whip up. To make vegan omit chicken and goat cheese. Add in roasted diced red peppers for more flavor. You may you any dressing you like. Sometimes I like adding 2 teaspoons of fresh lemon juice and find that I don't need any dressing at all. 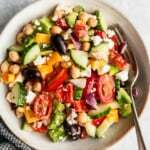 149 Responses to "Healthy Chicken Chickpea Chopped Salad"
Oh I just love any type of chickpea salad! This looks perfect for summer. Sounds great! I think I just found dinner for tomorrow night! I hear you’re coming back this way next month. Just a visit or more exciting possibilities on the horizon? Hi Sharon, I will be moving in! I’m so excited and I hope to see you and your family soon! Maybe dinner! Wow this looks so good…just like my mom’s food! 🙂 Reminds me of home! 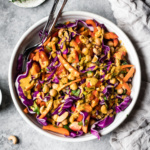 This looks not only light and healthy, but also very delicious and delightful! Monique, so happy you’re moving here. If you’re cooking dinner, girl – I’m there! We’ll have to come down after Bart gets back from Kenya! Call me a newbie, but how do you grill corn? On the cob then cut it off? Or is it kernals? Thanks! Yay! So glad you loved. Mmmmm I just made this and I’m eating it now! So delicious! I added green onion and made my own BBQ dressing my mixing lemon juice+olive oil+dijon+my fav bbq sauce+s+p. Yummy! Love the salad! Good any time as a salad or a main course. Looks great! Do you have a recipe for the BBQ dressing? In college I ALWAYS had the same thing for dinner, chicken ceasar salad (it was easy and quick, plus no mess) this is something I’ve yet to try but would undoubtably LOVE, but id like to know about the dressing. I hate storebought as its full of all sorts of unnatural and unhealthy things. So…how do you make the BBQ dressing? Thank you for the receipe—-really loks good. “You may you any dressing you like. 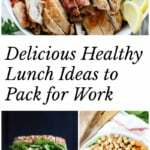 Sometimes I like adding 2 teaspoons of fresh lemon juice and find that I don’t need any dressing at all.” You may USE any…. I tried this lastnight and it was amazing. I even brought some to lunch today. I did however substitute the chicken breast for boneless chicken thigh meat and I didn't need dressing, with the goat cheese it sort of binds it all together. IT WAS DELICIOUS. I love your recipes! Great recipe- used the BBQ sauce +little mayo+ dash of ranch seasoning for dressing. YUM! Great recipe for a GREAT person!! This was incredible. Quick, easy, cheap and YUM. It was so good, I'm having a hard time believing it's healthy. Thanks for a new staple. Found this on pinterest. Looks super good! Going to try it soon 🙂 <3. I just found your recipes on Pinterest and I can't wait to try this salad; it looks so amazing. 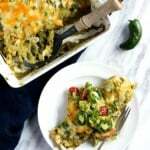 I want to try several of your recipes and I love that they are really healthy. Thanks a lot for this great recipe, it looks yummy..
Just ate this for lunch and added about 1/2 cup quinoa cooked in chicken broth (for added protein). I’ll be eating the same thing for dinner – it is THAT good. Thanks for the recipe!! um….ok. This was amazing! Sooooo fresh and yummy. I made some a salsa dressing from salsa, lime juice and some olive oil and it really complimented it well. Looooved the corn on this salad even though mine wasn’t grilled. Can only imagine if it were. 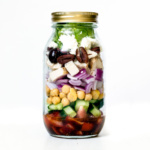 Whoo to the hoo for new salad recipes!! p.s….I also made the brussel sprout salad you put in a Friday Favorites (the one with hazelnuts and dates)….you must eat it. MUST. I made this last night for dinner…when my daughter saw it, she said “are we just having salad?? ?”haha…then she tried it and reckon’s, “oh man this is yum”……and it was…it was SO super yum…thank you so much! Thanks for this delicious recipe. It's the perfect dish for hot summer days! Oh Monique, this looks amazing. We eat our fair share of chick peas around here, and I have to say, I am thinking this will be added to the menu for tomorrow night. I was looking for something light and refreshing. 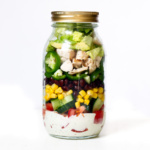 Do you have a BBQ dressing recipe as well? Yummy. I am going to make this soon. hummm yummy je vais l'essayer c'est certain……. This looks like my kind of salad! I would probably add some kind of fruits though, maybe grapes? STill sounds delicious either way! If you have a moment, do you mind checking out my blog please? 🙂 Thank you! this is delicious but c’mon! the prep is way more than 5 minutes! This looks like a good one for anyone looking to eat healthy in the coming year! making this now… can't wait!! yummy. wish we were there to help y'all eat so you would not have left overs. I wish I had your talent expertise. Nah.. That was Cracker Barrel and the infamous hot dog place in Richmond!! Lol!! Hi Monique this looks great, I’m curious what you suggest for barbecue dressing? I’m hoping to make this for a birthday potluck tonight! Glad to find you through Buzzfeed! I’ll be making this early next week. It looks fantastic. I wouldn’t have thought of barbecue sauce for a dressing. I might try that. Ohmygoodness. This was perfection!!!! I love chickpeas on salad. So, so good! How many servings is this supposed to yield? Haha, good old college memories! I wish my eating habits in college consisted of big salads and martinis! I was a beer and wings kinda girl. Now, I’ve upgraded! 😛 This salad looks delicious! Can’t wait to try it out! I am going to make this salad for my family. Do you happen to have nutrition facts for this recipe by chance?? It looks great! Definitely making tonight! 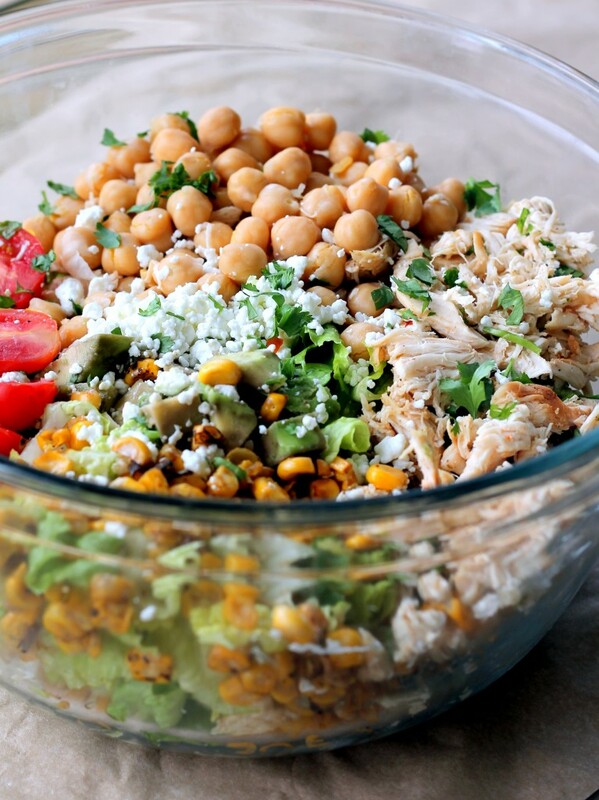 This looks so good….I love chickpeas. Can you tell me how you prepped the chicken? As far as cooking, spices? Thanks! They look delicious, thank you!! I just want know why this isn’t called “Chicky Chicky Chop Chop”? Honestly, it’s the only thing I need to know. But it does look great, and I can’t wait to try this salad! Haha both work! It’s delicious – such a great lunch. Hope you love it! This was amazing! I don’t like chickpeas usually, but I decided to try this to be more healthy. I didn’t use any chicken, so I used a jar of roasted red peppers as suggested and swapped the goat cheese for feta (it was what I had in the fridge). I didn’t need any dressing, and I can’t believe how tasty it is without any added salt or dressing! Thanks so much! I make this salad ALL the time. It’s delicious, easy and filling. I keep the basics the same, but mix in whatever other veggies I have handy (cucumbers are a really good addition!). I generally use whatever box of organic greens I have handy. A firmer cheese is key as softer ones get really messy and don’t keep well if you want to keep the salad for lunch the next day. I always use a homemade dressing, generally a light lemon vinaigrette. Highly recommended! I’m so glad you love this one! It’s perfect for customizing.